InstaForex review - Is it safe to trade online with InstaForex? Over 2,000,000 avid investors trade using the InstaForex brand which was incepted in 2007. On a daily basis, a little over 1,000 customers launch accounts with the company. All these clients benefit greatly from opportunities for efficient forex market trading, as well as superb customer and on-time technical support. There are several reasons why InstaForex’s trading conditions are rightfully deemed to be one of the top-notch worldwide. To begin with, customers gain access to a wonderful array of around 300 financial tools. Secondly, foremost companies, such as e-Signal, Dow Jones, MetaQuotes Software, and Reuters, provide excellent software products and cutting-edge information technologies to InstaForex traders. By the by, the Forex enterprise was among the first amid international and local brokerages to provide their customers with a chance to launch trading accounts on the newer MetaTrader 5 platform. InstaForex is constantly striving to maintain its leading position by continuously enhancing the array of services and technologies it offers. Winner of “The Best Broker Asia” numerous times, the InstaForex Group comprises of several brokerage enterprises in different countries. In most countries, the services provided are by Insta Service Ltd, which is registered on the island of St. Vincent and the Grenadines. No special licence is required there for the provision of Forex services. The Group is also a part of the Russian stock exchanges as a licenced stock broker. Every InstaForex account is a general trading tool for helping one work on the global financial markets. 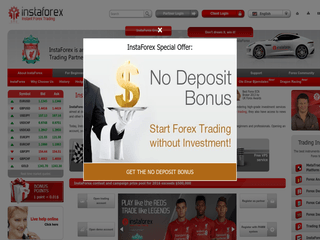 Irrespective of the type of the account, when working with InstaForex, each holder will obtain access to every trading symbol that is available. Two (2) trading accounts have been designed by the Dealer Department of specialists of InstaForex. They differ from each other by the method of commissions and accounting spreads, which are selected by the investor when he/she is launching an account. Should you want to use standard trading terms and operate without any fees, then the Insta.Standard account is your pick. As soon as an investor acquires access to all trading instruments, however, he or she has to pay a fixed spread. This account is appropriate for any type of traders and lets a trade be settled without fees and with classical spread. The account’s universality is its key advantage because frequently a trader can alter the leverage and choose a deposit size that suits him/her. The Insta.Standard account packs features, such as Micro Forex trading (including a min. deposit of $1-$10), Mini Forex trading (min. deposit $100), and Standard Forex trading (where the min. deposit is $1,000). The Insta.Eurica account does not necessitate any payment of spreads when initiating a trade. For the majority of Insta.Eurica trading instruments no spreads are applied and owing to this fact, the BID and the ASK price are always equal. Nonetheless, it should be borne in mind that the price offered goes higher than the BID price by ½ of the standard spread for a selected trading instrument – and this is rounded up to the instrument’s integral value because of some MetaTrader 4 technical peculiarities. The Insta.Eurica is suggested for tenderfeet on the Forex market as no consideration of the spread in case of using pending orders is necessary, meaning that a pending order is performed as soon as the price reaches its value if the spread is equal to 0. This account can also be made use of by experts and professional traders because it bears the same trading characteristics as those of the Insta.Standard account. There are also two (2) more accounts – Cent.Standard and Cent.Eurica – crafted for beginners and oriented towards those who simply would like to practise trading and they only require the minimum trade volume possible. InstaForex also has a demo account very appropriate for new-fangled traders. MetaTrader 4 and MetaTrader 5 are both accessible at InstaForex. In spite of the wider array of trading opportunities that MT5 offers, the majority of traders are still hooked to working on MT4. It offers a wonderful range of features, including automated trading, 8 time frames, online news about the financial markets, throngs of technical analysis tools, locked positions, one-click trading, 128-bit encoding, trailing stop, the ability to construct your own advisors and indicators (MQL4), and an amazing selection of free advisors and indicators. In comparison to MT4, MT5 has 13 time frames more, making them altogether 21. Additionally, it is packed with the newer MQL5 programming language and pending orders have expiration dates. MT5 also possesses automated quotes archive, more advanced technical tools, and placing Buy Stop Limits and Sell Stop Limits is now possible without expert advisors. Not only InstaForex utilises high levels of security and 128-bit encoding but it also puts clients’ money in segregated accounts, thereby offering defence of their funds against any type of force majeure situations in relation to the activity of the company. When we talk about the customer service of InstaForex, only superlatives will flow. Their chat system is absolutely fabulous and their responses were ultra-fast and up to the point when we contacted them about an issue. What is even greater are the nine toll-free lines at various locations across the globe. InstaForex can also be accessed through several e-mails and via the convenient Skype, Viber, Whatsapp, ICQ, Telegram, AOL IM, and Twitter options. This torpedoes the broker in the customer’s outer space. InstaForex’s website speaks English, Arabic, Azerbaijani, Bulgarian, Chinese, German, Farsi, Lithuanian, Romanian, Spanish, Ukrainian, Uzbek, Hungarian, Italian, Malay, Russian, Thai, Vietnamese, French, Hindi, Japanese, Pakistani, Serbian, Turkish, Bengali, Georgian, Indonesian, Korean, Portuguese, Slovak, and Dutch. InstaForex punches above its rivals’ deposit and withdrawal weight by offering a swarm of methods for replenishing an account. These include Bank Wire, MegaTransfer, PayCo, Skrill, InstaForex Benecard, NETELLER, China UnionPay (only for Chinese residents), Western Union, MoneyGram, Paxum transfer, AstroPay, Boleto, BPay, Carta Bleue, CartaSi, ePay.bg, eps, GiroPay, iDeal, Maestro, Nordea Solo, Poli, PostePay, Przelewy24, Skrill Direct, Sofort Banking, Trustly, Bitcoin, and local transfers in many countries. Most of these transfers require no fee and are instantaneous. InstaForex reminds its future customers that the currency and payment method should be the same both for withdrawing and depositing. With InstaForex, you can literally drive your success in chic and style while sipping a gold-flaked coffee in your new Lamborghini, Lotus Elise, or BMW X6. The annual prize pool of the innovative broker’s Forex contests surpasses half a million American dollars. To further pamper its clients, InstaForex offers 30% deposit bonuses, as well as it offers them an opportunity to gather bonus points to be able to pay up to 50% of their purchases. These bonus points automatically get into the live accounts of investors for every closed deal. All they have to execute are operations on the currency market or acquire points for each trade their referrals have closed.